Toyota builds around 14,000 vehicles a day in Japan. TOKYO -- Toyota Motor Corp. will suspend production at all assembly lines in Japan for six days this month due to a parts shortage, hitting exports of such cars as Lexus luxury vehicles. The shutdown comes after a Jan. 8 explosion at a steel factory in Japan torpedoed supply of steel used in such parts as engines, transmissions and chassis systems, Toyota said. Overseas plants will operate normally. The suspension, from Feb. 8 through Feb. 13, could cost Toyota as much as 84,000 units of lost production and possibly around 14,200 units of exports to the United States. Toyota declined to detail the shutdown’s impact on output. 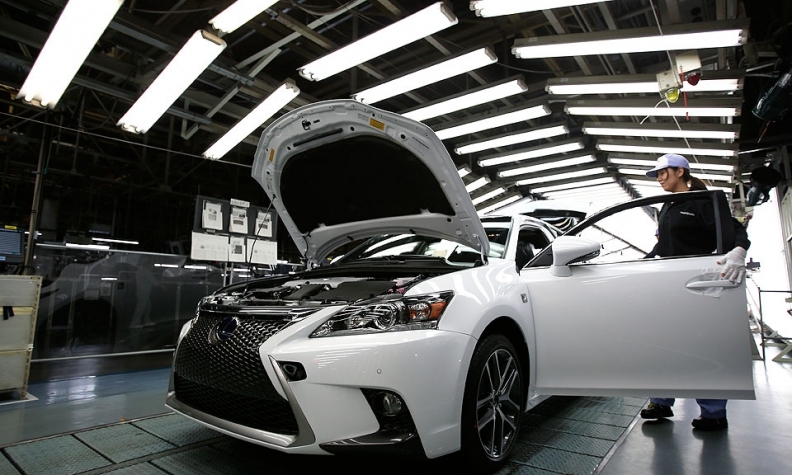 But the company produces around 14,000 Lexus, Toyota and Scion vehicles a day in Japan, and exports about 17 percent of that domestic output to the United States. In the U.S., Toyota sources about 71 percent of its vehicles from North America. But key nameplates, including most of the Lexus and Scion lineups and the flagship Toyota Prius hybrid vehicle are still imported from Japan. The explosion occurred at an Aichi Steel Corp. plant in Chita city in Aichi prefecture, Toyota's home region and its main production base. Toyota’s domestic assembly plants will resume operations on Feb. 15. The automaker said it is looking for work-arounds to the steel shortage including sourcing steel from alternate lines at Aichi Steel and getting metal from other steelmakers.